The Godzilla Destroy All Monsters Toho 12-Inch Vinyl Figure recreates the big lizard's appearance in the movie Destroy All Monsters. 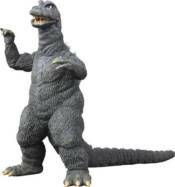 In the film, Godzilla is the leader of the Kaiju Army Corps that protects Earth from space monster King Ghidorah. Now you can protect your collection with this 12-inch tall vinyl figure that faithfully duplicates that Godzilla with the unique facial expression appropriate to a hero!